8' Table with table cloth in the upstairs hall. 10x10 booth space (non-corner) on arena floor, includes 1, 8' table with table cloth and draped back and sidewall. 10x10 corner booth space on arena floor, includes 1, 8' table with table cloth and draped back and sidewall. 10x10' Exhibitor booth located on the arena floor. Includes 1, 8' long table with table cloth and draped backwall and sides. Please note: NOT currently available to direct sales representatives. Showcase your business at the NEW Local Business Expo '17! 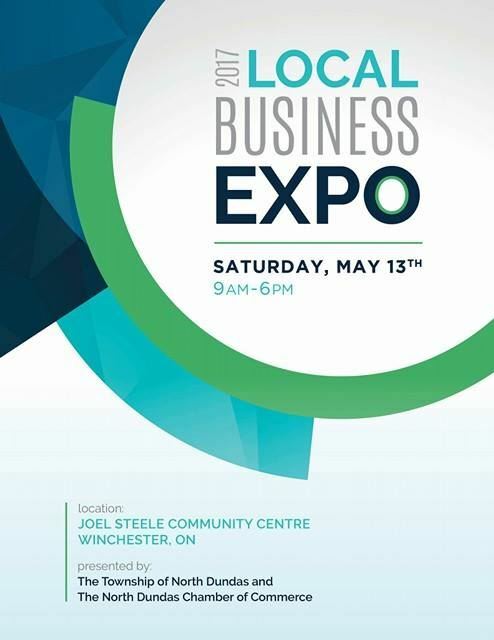 The North Dundas Chamber of Commerce and the Township of North Dundas are pleased to be partnering to showcase YOUR BUSINESS! Don't miss this opportunity to present your business and services to our region. The day will be packed with entertainment and demonstrations with a multitude of ways to get your business noticed. Your booth fee includes listing in the Expo's Show Guide (additional advertising also available), plus we are offering a main stage as well as a seminar room for exhibitors to present short demonstrations or hands-on seminars (upon approval/availability) throughout the day. We will also be providing "goodie bags" to the first 200 visitors with coupons and special offers from our exhibitors. Booth space will be allocated on a first-come, first-served basis so don't delay! Include your special offer or coupon in the show bag: Free for members; $25 stuffing fee for non-members. You must provide 200 coupons or special offers - maximum size of a single 8.5"x11" folded in half.